There is something great when you can combine different elements of fashion. Mixing high-low or casual and dressy are go-to strategies to add something interesting to your outfits. Khaki skinny jeans are a way to blend two casual looks. Both Khaki pants and blue Jeans have there roots in utilitarian work-wear. Jeans originally were worn by miners, ranchers and farmers. Khaki trousers have origins as a light weight pant worn by the military. Khaki pants are a comfortable, unassuming, casual staple. Denim is also standard and ubiquitous casual-wear. Color/tint jeans or garment dyed jeans are a great way to add variety to your denim wardrobe and khaki color + denim is a look that just broadcasts casual and laid back. Khaki pants are a lightweight trousers, often100% cotton but sometimes blended with wool or synthetic fibers. Khaki color falls broadly in the range of shades of light brown, usually some shade of beige or tan. 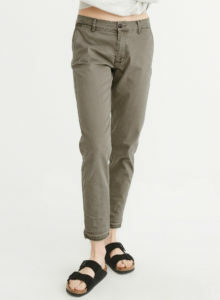 But pants described as khaki can be an olive green or a muted, dust gray as well (and are often merged with the closely related chino pants.) Therefore, you may see jeans casually described as “khaki jeans” where the color of the jeans can range from light beige to olive green. 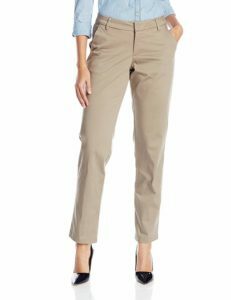 Here are photos of what are often called Khaki pants – color can vary and sometimes “chino” is used interchangeably with “khaki” to refer to a style of pants. There are three basic ways to go with casual outfit ideas for khaki jeans – 1.) stick with a neutral, muted earth tones and white pieces, 2.) add bright color or patterned pieces to contrast with the muted color of khaki 3.) add deep, rich or dark color with tops and accessories. Cameron Diaz pairs skinny khaki jeans with strappy heels while Hailey Baldwin opts for sneakers for an ultra casual look. You can mix shades or hues of the colors in the khaki family. The combinations that follow are olive green plus tan or beige colors. Emily Ratajkowski and Ashley Greene for example, wear camel and beige jackets over a white/pale top with khaki skinny overalls (Emily) and khaki skinny jeans(Ashley). Sophia Vergara wears cropped khaki skinny jeans and adds breezy chicness by pairing an orange top together with red heels, beige handbag and sunglasses. Kate Moss keeps it basic but classically chic. She wears a black jacket over a black top with low rise khaki skinny jeans. Dark sunglasses, a wide black belt and black ankle boots complete the look. Similarly, Taylor Swift pairs her khaki skinny ankle jeans with a deep navy top and adds a splash of fun with yellow flat shoes. Kate Hudson wears khaki skinny jeans with a blue chambray shirt over a t-shirt for a double denim look. As a matter of fact, wearing different weights and colors of denim is one of the ways to style a denim on denim outfit.